Today’s blog post is from one of my co-workers, Kim C., who is just starting to reconnect with his blog Culling & Sifting. We have a stressful week coming up at work, so we decided to have a bake-off this week to lighten things up. I made Lex’s Dutch Pretzles (which were fantastic and easy), there was apple corn bread, an apple raisin bund cake, and Kim’s apple pie. Needless to say, it has been a delicious week! Kim was fabulous enough to write a post of his (apparently) famous pie-tart thing…. I grew up in Maine where I always had 50 pounds of apples kept cold during the winter in the garage. At some point, I thought I would make apple pie… and then received lavish praise for it from my mother. I made many pies as a teenager. Looking back I must have made some terrible pies with crust like limestone and filling so sweet it could have given someone diabetes from one slice. But for some reason my family encouraged it and I continued to make them. I even married someone who doesn’t like sweets, but likes apple pies. A wonderful couple gave me The Pie and Pastry Bible by Rose Levy Beranbaumand I sat down and read it all in a day. I filled it with Post-Its for things I would make on chilly days to fill the house with that fragrance of comfort (yeah, sigh.). I have jerry-rigged one of the pie crusts and adapted the apple preparation from this book as well. The book is intensely precise in its directions, so much so that I feel either overwhelmed with ineptitude or expertly prepared. What drew me to this recipe is that it is the first one in the book AND that it is done in a 1 gallon resealable bag. Also there is significantly less flour on everything within 20 feet, less bowls to wash, less manhandling the butter with my hot hands, less of the terrible stuff and more good pie. Par-baking the crust would give you a much flakier crust as a whole, but I like the crust that meets apple thing. Blend dry ingredients in a 1 gallon resealable plastic bag. Add butter in bag and mix it until it looks like wet sand. Don’t let it get warm. It should stay cold. Add water and vinegar and mix until it all holds together. You may need to adjust the flour or the water, but add very little at a time. 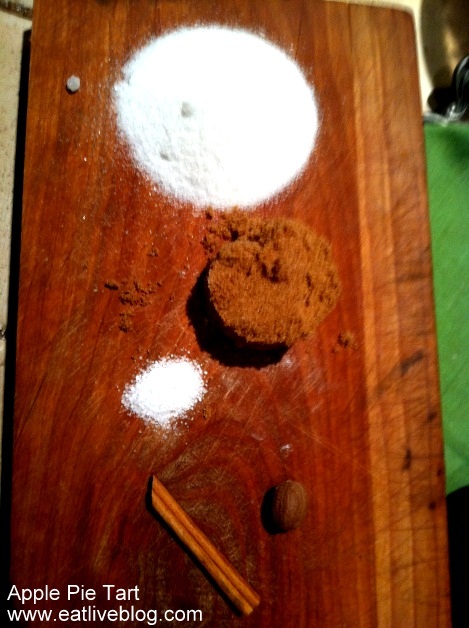 Mix sliced apples, lemon juice, sugars, salt, nutmeg, cinnamon in a bowl and let macerate (aka: marinate) for 30 minutes. Put a colander in a bowl. Pour macerated apples into the colander and allow to drain for 10 minutes. 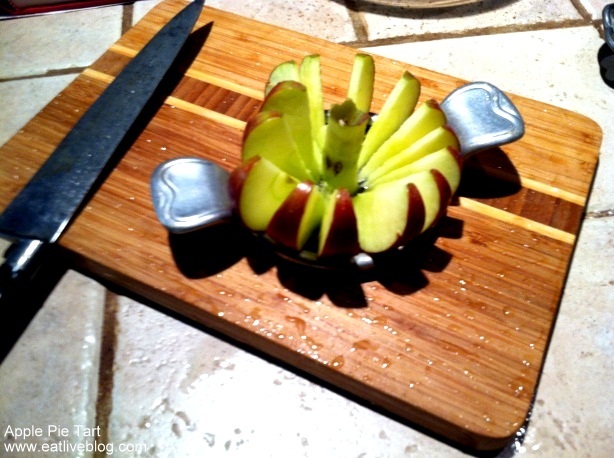 Return apple slices to original bowl and mix in corn starch until it is absorbed by the apples. Pour the liquid from the bowl under the colander into a pot and add the butter and reduce to about half. Take off heat. The pie making now happens! Preheat the oven to 425 and put the rack on the lowest position. Line a cookie sheet with a lip with foil and place on the rack. This will catch anything that spills over. 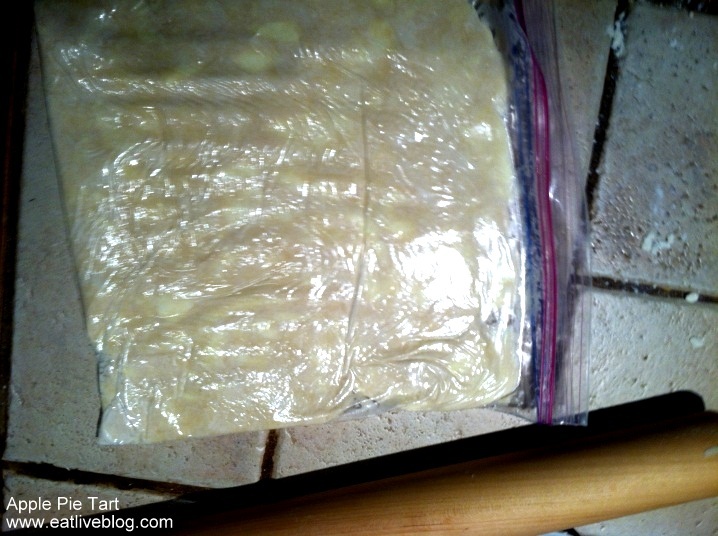 Take the pie crust out of the freezer and roll out, keeping it in the bag. Take rolled crust out of the bag and press into the pan. It may take a little fixing. It will shrink a little when you cook it. Make sure you get enough on the lip. Fill with apples and pour reduced liquid over the apples. Allow to cool for 30 minutes before you cut into it. 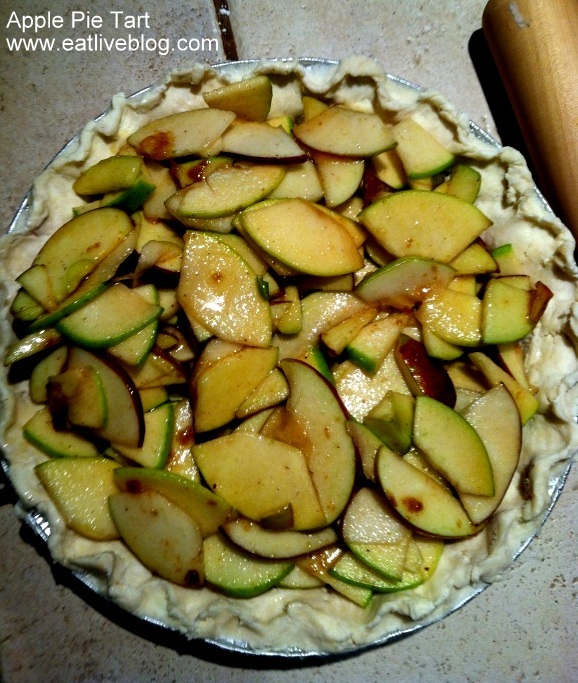 This entry was posted in Recipes and tagged apple, apple pie, apple tart, baked goods, dessert, fall, october, pie, recipe, tart by reneeh. Bookmark the permalink. Sounds delicious. I have yet to find anything as perfect for fall as a piece of warm apple pie. I’ve never heard of this crust-making technique – I like it! 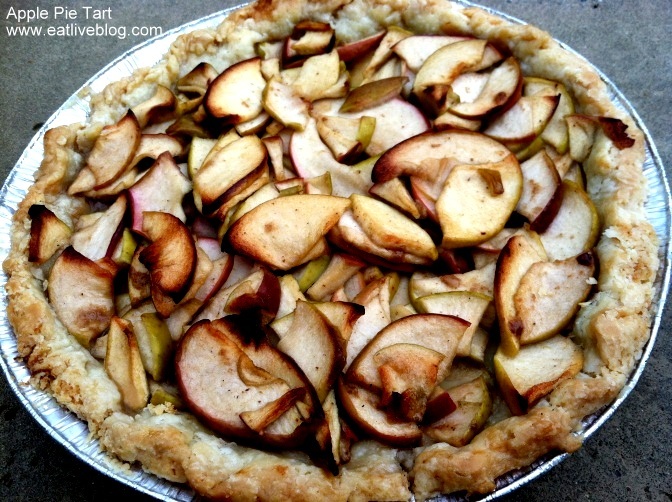 I had a similar pie but the thin ( peeled) apple pieces were stacked like planks, tightly together. May have even had a press on it to flatten. There must have been cornstarch sugar, cinnamon, etc. but not a lot. There was a thin bottom crust and a roll of crust along rim of pan. Each piece was drizzled with Carmel sauce. Not much sugar on the apples. Very innovative. I plan to try to recreate. Had this one at a restaurant called Hege’s after the owner, on Kiawah in SC.